Searching - 90's Eden WHITE SLEEPING RABBIT Thermal Body PINK PLASTIC NOSE Lying Down? Home→SEARCHING→Searching – 90’s Eden WHITE SLEEPING RABBIT Thermal Body PINK PLASTIC NOSE Lying Down? 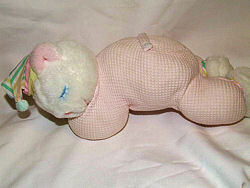 Searching – 90’s Eden WHITE SLEEPING RABBIT Thermal Body PINK PLASTIC NOSE Lying Down? A searcher is calling for help from all good searchers. So now the truth comes out. I am unable to find bunny on my own. This rabbit is my boss’ daughter’s most precious bunny that she has had pretty much since birth. Her family had been looking for a backup for years and couldn’t find any. I would like to repay all the good things that my boss had given me by finding bunny’s twin sister, and I am willing to pay whoever finds it. The bunny is made WITHOUT clothes. My boss had to sew on several baby clothes on top because the head fell off, then the legs… she did a wonderful job on “keeping her together”, ha ha. The bad thing is, I do not know what it looks like on the inside. Bunny is made by Eden in 92-94. She is 12 inches tall (keep in mind that she is now flat, so actual size might be shorter). She used to crouch down like the picture on top left. Unlike the ones often seen on eBay, her nose is pink plastic and she has closed blue yarn eyelids with 3 eyelashes. She wears a yellow satin ribbon on her neck. Head, paws and feet are made of white plush. Her original non-removable PJ/ onesie is pink thermal material that looks like the baby doll I included in the picture. Inside of ears are soft pink cotton fabric. Top middle picture shows that between the plush and PJ, there are criss-cross green and yellow cotton fabric. Mouth looks like an sharp arrow pointing down (smiling). She is NOT a rattle, just a bunny doll. My boss recalls that bunny used to have buttons on her tush, maybe it’s a flap? Through layers of sewn clothing, I cannot feel any tail on her, but it could’ve fallen off a long time ago. So, I hope that one of you wonderful searchers have better luck than I do in finding this precious bunny doll. I have a year or so before she goes to college. We are very grateful of any help. Ask me questions anytime, you know I visit here everyday =). Kimberly provided a photo of the BEAR. Anastasia is searching for the RABBIT! 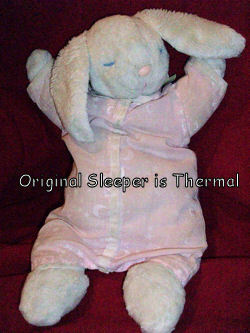 If you can help Anastasia find this 90’s Eden White Sleeping Rabbit with a Pink Thermal Knit Body and a Plastic Nose, THIS SITE IS NO LONGER ACTIVELY MANAGED. Please use Our FREE FACEBOOK GROUP, including #101508-1 in the subject, . Close, Eden bunny, sleeping, without the pajamas. I sent it to Anastasia. Could be the right body shape. If so, I’ll add the photo to the post. Thanks tami (with lower case t). It’s very close, but the original bunny’s body is non-removable pink thermal material. Apparently, she is not lying flat but on four feet when brand new. There will be buttons/ flap on rear end. So sorry for being so picky, but you guys are such good searcher. I’m positive that one of you will find it =). Ana. Squishy soft too — I am thinking that this bunny had a striped hat very similar but can’t quite remember – I would think so. Wow, Kimberly! Based on the descriptions given to me, that is definetely it. She never told me about the hat, but maybe it was removed for child safety. I would say… that’s what she meant by bunny standing on 4 feet. We’re getting closer. I’m glad that this bunny’s relative actually exists, it really gives me hope. Thanks so much, Ana. I used your photo. That helped a lot!!! Thanks Kimberly!!!! You’re quite welcome Rosemary — and I hope Ana is able to find the bunny soon!